Albert Camus. One of my favorite theologians. It occurred to me that the abyss Camus mentions may be what gets crossed when we experience awe. Somehow we let the absurd in, or the mute world gives us a shout. Immanuel Kant used the phrase ding an sich, the thing-in-itself, to name that from which our senses separate us. We experience the ding an sich, the mute world of Camus, only through our senses, through our sensory experience of certain qualities, qualia, that the thing-in-itself presents. We do not, in other words, experience that which has the qualities, but only its qualia and then only those within the very limited range of qualia accessible to our senses. The ding an sich, the abyss, a reality greater than yourself all name a something beyond ordinary experience. There are many ways of articulating the gap between us and the ding an sich, the things in themselves. Here’s one I like. 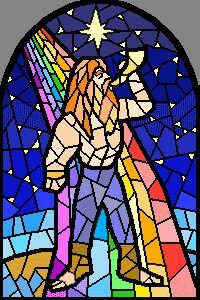 Bifrost is the rainbow bridge of Norse mythology. 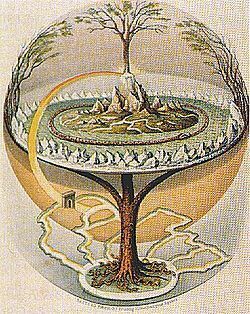 As in this illustration, bifrost connects Asgard, the realm of the Aesir (Odin, Thor, Freya), and midgard, or middle earth, the realm of humans. Awe could be a brief moment when we stand not on midgard but on the rainbow bridge, able to catch a glimpse of the realm beyond us. What all of these ideas suggest, I think, is that a gap exists between an individual and the really real. An important religious question is what is beyond that gap, or what constitutes the gap, or what is the significance of the hidden for our spiritual lives. I don’t know how to answer that question. Camus’ notion of the absurd makes sense to me. If that’s not an oxymoron. What I do know, for sure, is that the only tool we have for answering it is our experience. Awe may help us. It may allow us a momentary peek into the abyss, or place us on bifrost, or pierce the veil of maya. What has awed you this day? This week? This year? In this life?